Place chicken, breast up and with its legs to your right if you're right-handed or to the left if left-handed, on cutting board. Remove ties from legs. For easy cleanup, use a disposable foil roasting pan. 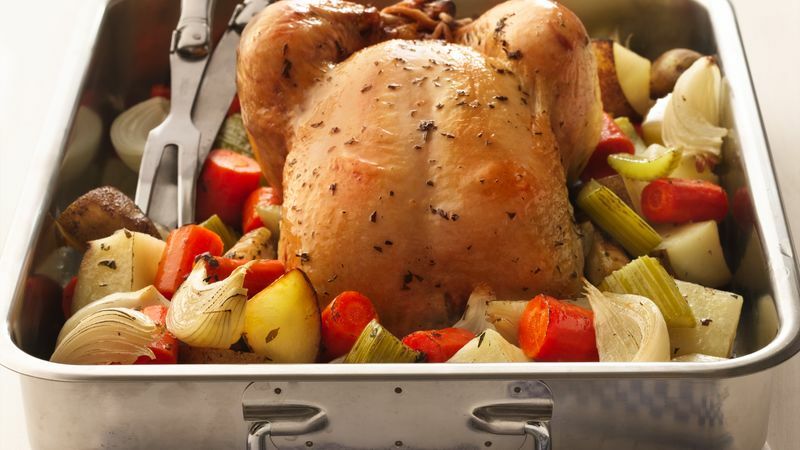 For easier handling of the heavy chicken and vegetables, buy a heavy-duty roasting pan or use two lighter-weight pans. If you have an ovenproof platter, place the vegetables on the platter, cover with foil and place in the oven, which has been turned off, while you carve the chicken. Fold wings of the chicken across its back so that tips are touching. Tie the legs to the tail with string or use skewers; if the tail is missing, tie the legs together.